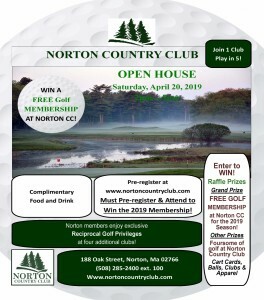 Norton Country Club is one of the most sought after destinations for your smaller group or business outing in South Eastern Massachusetts and Rhode Island. Our meticulously manicured 18-hole golf course along with our Professional Staff are the perfect compliments to make your event a complete success! Group Outings are for groups of 20-52 golfers with tee time reservations which can be made months in advance of your event date. You may customize your event by adding a meal and/or Pro Shop merchandise! Thank you for considering Norton Country Club for your Wedding, Special Event, Golf Outing or Golf Membership. It is our goal to exceed your expectations and assist you in any way possible during your experience with us. Look no further than our experienced staff to accommodate all of your needs.